Building future socio-economic-environmental scenarios into a macro-economic framework implies making assumptions on trends of exogenous variables or calibrating endogenous variables. Typically, modellers start with building reference/business-as-usual ‘no policy’ scenarios and then simulate policy experiments in order to achieve policy targets. The APPS project uses as a reference source for scenarios those developed by the climate change community and known as Shared Socioeconomic Pathways (SSPs). 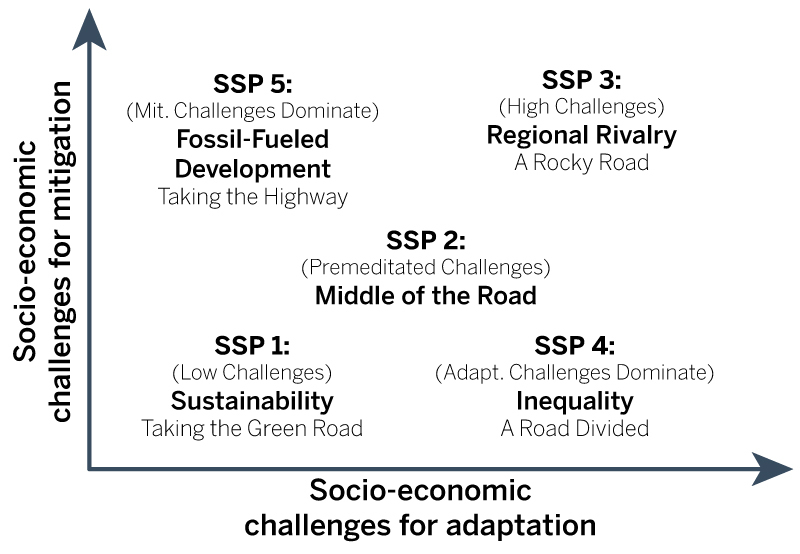 They are connected to different mitigation/adaptation challenges and, more extensively, to sustainable pathways of future economic development. Scenarios are based upon specific assumptions on both exogenous and endogenous variables at the national/regional level. SSPs provide future patterns for population as well as labour force and cropland area. Other trends for exogenous drivers such as primary factor productivity, sector-specific efficiency, total factor productivity and energy prices are then used in order to calibrate given endogenous variables, namely GDP, energy use, emissions and value added shares. Source: O’Neill et al. (2017).